Not so long ago, the notion of bringing a Modern Sporting Rifle (MSR) into the field as a serious hunting tool seemed like a highly foreign concept. Indeed, over most of the 20th century, the hunting woods were almost exclusively the domains of traditional bolt- or lever-action rifles. These rifles sported a classic wooden stock that may or may not have been scratched up, depending on how often they were used; if their owners cared more about practicality than looks, some might also have featured synthetic stocks. And there might have even been a few traditionally designed semi-autos. But an AR-15 or similar gun used as a hunting rifle? Unlikely. Of course, this has changed tremendously in recent years. The market for AR-style rifles has flourished over the past decade or so, and in this boom of black rifles, manufacturers and shooters have branched out from the AR’s typical territory as a “tactical” rifle. People using the AR to hunt have begun to realize that the platform’s relatively good accuracy and the ability for a rapid follow-up shot makes for a pretty darn good hunting rifle, especially when paired with the right load. Manufacturers, on the other hand, have been able to market their black rifles to a new, previously unreached segment of the market. While it’s probably fairly naïve to say that MSRs are anywhere near as commonly used afield as bolt-action rifles or shotguns for hunting, or that they’ve started to eclipse the bolt gun as the preferred hunting firearm, their use in the field has grown dramatically. This is especially true in some of the less traditional hunting spheres, such as hog and predator hunting, where the opportunity for multiple shots is more common and the regulations less restricted. 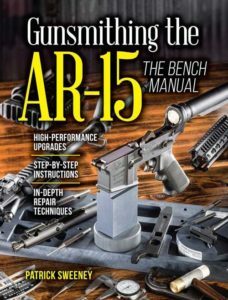 The AR-15’s standard chambering, the 5.56 NATO/.223 Rem., has always been respected as a highly capable, flat-shooting predator and varmint cartridge, so it makes sense that today’s manufacturers are finding ways to improve other aspects of these rifles to make them even more suitable for hunting use. A perfect example is SIG Sauer’s new M400 Predator. SIG Sauer introduced the original M400 Predator back in 2013, building off its earlier M400 base model. The basic M400 was significant for SIG because the manufacturer was already well known for producing gas piston-operated designs, and the M400 used a more traditional direct-impingement gas system like those found on the majority of ARs. The original M400 Predator incorporated this same system, but came with a longer 18-inch barrel, a fixed Magpul MOE stock, and an aluminum free-floated, tube-style handguard—features designed to aid the shooter in precise shooting at extended ranges, such as those sometimes facing predator hunters. This past year, SIG went back to the M400 Predator design to upgrade it once more. Most readily apparent, the manufacturer swapped out the fixed MOE stock for a more versatile telescoping MOE Carbine stock and traded the previous forend for ALG Defense’s Ergonomic Modular Rail (EMR) V2, a slim-profile, free-floated aluminum forend with M-LOK attachment points for mounting forward accessories and a small Picatinny rail section near the front for an iron sight. Both of these changes seem beneficial to the overall rifle. The stock allows shooters to adjust length of pull to fit their needs, which, for a bundled up predator hunter in the middle of winter may be very necessary. The new ALG Defense handguard also seems like a definite improvement, being quite slim and lightweight while offering ample mounting points for things like a light, laser or bipod. Although those accessories may seem inconsequential to some hunters, for those in states that permit hunting predators at night using lights and/or night vision devices, having that capability is certainly appreciated. Not to mention the fact that the forend itself feels very smooth and comfortable in the hand. ALG Defense’s Ergonomic Modular Rail (EMR), V2 M-Lok forend. The new and improved M400 Predator also features an 18-inch stainless steel barrel that comes pre-threaded with ½-inch-28 threads for those wanting to run the gun with a suppressor, an increasingly popular addition given the growing number of states permitting the ownership of cans and their use in hunting applications. The rifle comes equipped with a thread protector for when the shooter isn’t using a muzzle device. Another accuracy-enhancing feature is the two-stage, match-grade trigger that comes installed on the gun straight from the factory. This is something any predator hunter—or competitive shooter, for that matter —should appreciate as a standard feature. Take-up is smooth, and the trigger breaks crisp and clean at around 4.5 pounds, making for a truly accurate platform. The trigger is one of the most important aspects of any rifle designed for hunting or competition, and the one on this new rifle is quite good, and it pairs nicely with the ergonomic Hogue rubberized grip with pebbled texture. Like the original M400 Predator, the upgraded gun utilizes durable, hard coat anodized aluminum receivers, with the upper being a flat top design featuring a section of Picatinny rail for optics. No factory iron sights are included. Also similar to the original rifle, this new M400 Predator has a 1:8-inch twist barrel for stabilizing both the lighter bullets, such as those of the 55-grain variety, as well as heavier bullets in the 70-grain range that many hunters prefer. The new M400 Predator also remains a very lefty-friendly design. The gun retains the ambidextrous controls found on the original rifle, including an ambidextrous safety selector, ambidextrous magazine release and ambidextrous QD sling attachment points. The charging handle and bolt release are non-ambidextrous; however, the bottom of the bolt release does feature a slightly enlarged paddle that makes holding the bolt open easier. All these features are great, of course, but when it comes time to take a shot on a wary coyote or similar predator, you need a rifle that offers plenty of accuracy afield. There are plenty of instances in which your quarry may hang up at a relatively long range, and if your rifle isn’t accurate at moderate ranges, things certainly won’t improve as the distance stretches. Thankfully, the new SIG Sauer M400 Predator offers plenty in that department. For testing purposes, I equipped the rifle with another one of SIG’s great products, the Tango 6 3-18x44mm riflescope. The manufacturer has developed a ton of excellent riflescopes, spotting scopes, rangefinders and red dots in its relatively new Electro-Optics line, and the Tango 6 is a shining example. The model I used featured a first focal plane reticle with illuminated milling marks and 1/4-MOA adjustments and came with SIG’s LockDown Zero System turrets. It was a very nice optic, and one well suited for mid- to long-range tactical shooting, as well as hunting. The telescoping MOE Carbine stock is a great option that allows users to adjust length of pull to meet their needs. During testing I used two different loads to measure performance: HPR’s 55-grain FMJ .223 Rem. load and SIG’s heavier 77-grain Elite Performance Open Tip Match (OTM) .223 Rem. projectile. Velocities were measured using a Competition Electronics ProChrono Chronograph from Brownells placed approximately 15 feet from the muzzle. Accuracy data was the result of three, five-shot groups taken at 100 yards using a Caldwell Matrix shooting rest, also from Brownells. SIG Sauer’s Elite Performance 77-grain OTM load produced the best accuracy overall, with the average group size at 1.63 inches. The best group with the 77-grain OTM load was 1.3 inches. Meanwhile, the 55-grain FMJ HPR load produced a 1.87-inch average group, while its best group was 1.23 inches. These groups probably speak more to my abilities and the conditions present than what the M400 Predator is capable of in terms of accuracy. It was a cold, windy day on Colorado’s Front Range and I had done a fair bit of shooting before I set up to do the accuracy test. Regardless, these numbers are perfectly acceptable for most shooters, and I would feel plenty confident going after coyotes or any other predator with this rifle, especially given the gun’s completely malfunction-free operation during my time with it. The hunting field is no longer the sole domain of the bolt-action rifle. With manufacturers building quality, dedicated hunting ARs, the prospect of going afield with a MSR is looking better and better to many shooters. SIG Sauer’s new M400 Predator is a perfect example of a gun maker building an AR from the ground up to serve the hunting community. With its two-stage, match-grade trigger, pre-threaded 18-inch stainless steel barrel and slim, extended ALG Defense EMR V2 forend, this rifle is ready for any predator hunting task. And since it ships with a five-round detachable box magazine, it is already compliant with most state hunting regulations. Of course it will also accept standard AR magazines with larger capacities as well for those who want to use the gun for home defense, as a tactical carbine or for competition purposes. Overall, the M400 Predator is a reliable, accurate and sweet-shooting AR that comes with a host of great features, and it comes at a relatively affordable price for what you’re getting at $1,446. If you want a MSR that comes ready for serious hunting or competition right out of the box, look no further than SIG’s M400 Predator. The Tango 6, likewise, is a fully capable optic that performs with other elite glass and carries a price tag to match. Editor’s Note: This article is an excerpt from the February 2017 issue of Gun Digest the Magazine. Want to learn more about the AR-15? I like the scope but their is no price tag on it It would be nice too let us readiest know how much is this fine looking scope going for. A lot of the SIG Optics stuff is made in China and is identical to other brands you may be familiar with after a few cosmetic changes. The products will be stamped “Designed in Oregon, Assembled in China” which is somewhat misleading. Get a brand name that has a good reputation such as Leupold, Redfield (now owned by Leupold), Nikon, Burris, Vortex, or go upscale with Zeiss or Swarovski. Buy once, cry once. Take a guess on how I know this truth.